On Sunday morning I was among around 300 people who gathered at Silver Street Cemetery in Waltham Cross to give a wonderful send-off to Mike Gold, who died suddenly last week aged 51. Apart from his family, there were rabbis from Chabad-Lubavitch, the Jewish educational, outreach and welfare organisation in which Mike had been involved most of his life. 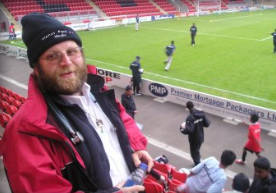 Rabbi Aryeh Sufrin MBE, the Executive Director of Chabad who is well known well beyond the Jewish community gave an inspiring account of Mike’s life from his childhood up to his far too early departure. The Jewish representation was outstripped by a mass of others who represented so much of Mike’s life and work. A huge group of young men and women from London Borough of Newham where, often in an uphill struggle against some of those in authority on the local council and in the face of government cutbacks to youth work, Mike had succeeded in rescuing them from becoming part of a street gang culture by involving them in sport from football to martial arts. Some of those youngsters were the second and third generation of those whom he had worked with. Many faiths were represented: Muslims, Sikhs, Hindus, Christians, and those who were just his neighbours. Mike will be massively missed by all he worked with in his many roles, and certainly by us in Redbridge and Epping Forest Together. Shalom and Salud Mike you leave us respected and loved. Bob Archer, former president of Redbridge Teachers’ Association and co-convenor of Redbridge and Epping Forest Together (REFT), writes: It is a real shame to hear that Michael Gold has died. He put in an enormous amount of his time and enthusiasm into helping young people and into fostering good relations in the community. Michael told me that he learned his first lessons in fighting racism while a pupil at a local secondary school where National Front supporters among the pupils were promulgating antisemitic views. He did not let them get away with this. His support and advice was greatly valued in REFT. Michael was an extraordinarily kind and generous man and he will be sorely missed. Every young person has a special talent, something they are good at. My job as a youth worker is to find and unlock that talent. This in turn will help a young person find their self-esteem and motivate them to plan and then reach their goals. The club culture that I aim to shape welcomes values and supports young people of various ethnicities, religions, languages, colours, disabilities and perspectives, and I aim to create an environment in which men and women can freely pursue their talents and callings in a climate that nurtures their full potential. This is achieved by leading-by-example. I try not making any pre-conceptions about a young persons’ ability and, where possible, I treat them all equally. I also challenge behaviour of a discriminatory nature, be it about race, religion, colour, gender, disability or even the type of clothes that they wear or type of music that a young person listens to; and when challenged, I try to engage the group in a discussion about the issues raised in order to make the learning opportunity complete. This culture of diversity should not only celebrate the freedom and vitality, but will allow young people to learn to interact and demonstrate leadership at home, at work and in the international arena. Only a diverse community can offer our young people a model of the workplaces and polities in which we expect them to interact. We need to prepare them for such environments by making the club itself a model of inclusion and respect for differing perspectives and diverse ways of living, learning and flourishing. Furthermore, I expect the young people I come into contact with to carry this model of inclusion forward to improve their own workplaces and life experiences. Only when young people accept diversity at home, can that respect spread to help heal the hatred in the world today. Additionally, I want to empower every young person. An empowered young person makes up their own mind and does not need to follow the crowd. An empowered young person knows the difference between right and wrong, moral and immoral and knows how to say no; and will say no.